LONDON, England (CNN) -- The far-right British National Party on Thursday agreed to consider letting nonwhite members join after the country's Equality and Human Rights Commission took them to court. BNP leader Nick Griffin, in a Web site video last week, said the rights commission was trying "to bleed us dry." The move would require a change to the party's constitution, which it will put to its members for a vote next month, a spokesman for the party told CNN. The members could, in theory, reject the change, spokesman John Walker said, noting "there is a range of opinions across the membership." But, he added, "We will comply with the law. Obviously we are going to have to comply to remain a legal entity." The party also agreed not to accept any new members until the change is made. The BNP "exists to secure a future for the indigenous peoples of these islands ... which have been our homeland for millennia," the party says on its Web site. It opposes "mass immigration" and "a federal super state in Europe," Walker said. Admitting nonwhite members will not change that, he insisted. "It's not going to change our policies," he said, pointing out that only members who have been in the party for at least two years and have attended training sessions are entitled to vote on party policy. "Anyone coming from an ethnic minority who thinks they will come in and change the party overnight has another think coming because it's two years before they have a vote," Walker said. "Anyone coming in to be a troublemaker, an agent provocateur -- it won't make any difference to us as regards the policies we pursue." And he said he doubted people from ethnic minorities would want to join the party, anyway. "I don't honestly think that were are going to be flooded with nonwhites wanting to join the BNP," he said. "I think we're the only nationalist party in Europe to have a bar on non-Caucasian, nonindigenous members, and we don't see [those other nationalist parties] going multicultural." The Equality and Human Rights Commission called Thursday's development a victory. "Political parties, like any other organization, are obliged to respect the law and not discriminate against people," John Wadham, the legal group director at the equality commission, said in a statement Thursday. The organization first contacted the party about its membership restrictions in June and took the party to court in August, it said. 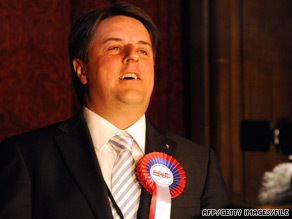 Indictments were issued against three top party officials, including party leader Nick Griffin. 'It is unfortunate that the BNP spent several months before conceding and dealing properly with our legal requirements," said Wadham. "We will be monitoring the BNP's compliance with this court order on membership, and its other legal obligations." But party spokesman Walker said the rights commission was merely harassing the party, and that the move could backfire. "We believe their prosecution was entirely vexatious, entirely politically motivated. The new equality bill coming in a few months would have forced us to change, anyway," he said. Griffin said in a video posted last week on the BNP Web site that the rights commission was trying to "bankrupt" the party through legal actions, "to bleed us dry." "In the long run, it could backfire on them," Walker said. "It could raise our share of the vote at the next election. People could feel the party is now moving into the mainstream" if it does not formally discriminate against nonwhites, he said. Britain must hold a general election by next spring. The British National Party won two seats in European Parliamentary elections in the summer, the first time it had ever won seats in Strasbourg, France. Party leader Griffin became one of the BNP's two members of the European Parliament. Controversially, he is due to appear on the BBC's "Question Time" news discussion program later this month, alongside other officials, including Justice Secretary Jack Straw. Griffin was convicted of inciting racial hatred in 1998. He was ordered to serve nine months in prison, a sentence that was suspended for two years. He was elected leader of the BNP the following year and re-elected in 2007, according to the party. The British National Party has about 13,500 card-carrying members, Walker said, but only a "few hundred" are eligible to vote, or expected to, on changes to membership rules next month. The party conference is tentatively set for November 14-15, he said.